Happy Friday, everyone! I’ll admit that this is one week that I’m glad to see come to an end. Not that it was a bad week – just full of unexpected stuff, ya know? What do ya say we end it with a bang with this week’s house tour? Jacque and Matt have graciously invited us to come snoop around their house. Before we start off our house tour I want to take a second to introduce myself. I’m Jacque and I am one half of the team. The other half (debatable better half) is my husband Matt. We DIY and blog over at theDIYvillage.com. We are constantly working on our never ending honey do list, which recently got even longer when we found out we would be expecting our first child in December of this year. Now that I have our introductions out of the way it time for what you have been waiting for our house tour! It’s your traditional standard issue suburban home in Tennessee. As you can see from the picture our neighbors are a mere stones throw away, but thats okay because it’s what is on the inside that counts. Right after we moved in we painted the walls orange and quickly started hand painting the trellis wall treatment. We worked really hard on the wall for a few weeks and then I got distracted by a “bigger, better” project (or possibly a shiny object there really is no telling with me). And the wall just sat there. Until in a moment of weakness I gave in and finished the wall, I think it turned out pretty well! Matt re-finished an old Naval Secretaries desk in turquoise that pops perfectly off of the orange walls. Just outside my craft room is a long hallway that is open to our front foyer. I have grand plans for this area of the house, just have to convince the other half that they are worthy! On the far end of our hallway is my nook, what a fun little space! The foyer is two and a half stories high and the perfect place for me to use part of my grandfathers window washing ladder! Moving on we will head downstairs to the main level. And visit Matt’s office. From the Boston Red Sox Fenway Park art and memorabilia to the WWII Band of Brothers inspired art this room is ALL Matt! Matt is a huge Red Sox fan, so much so that not only is the color of this room “CLAM CHOWDER” (fitting huh?) but he named our dalmatian Fenway! Go figure … next dog is Wrigley since I’m a huge Cubs fan! Matt has let me run wild in this room, it’s all me in here from the trellis pillows to the box pleated slip covers! The back side of the house is an open floor plan and rooms just flow right into each other. Just behind our couch is our kitchen. Separated only by an island and narrow wall. From the couch you get a great view into the kitchen including our Ball Jar Pendant Lights! This past spring I somehow managed to convince Matt that we needed a new custom pantry. I still cannot believe this is my pantry. I even got him to make me pull out drawers … I just adore them. Matt installed a beautiful split-faced tile and raised the microwave. But we (I) still have bigger plans that includes painting our builder grade cabinets! And am also enjoying our recently re-finished counter tops. 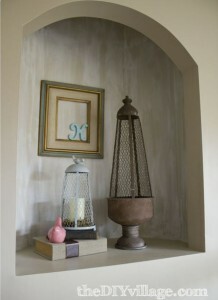 I love the look of the faux concrete. Last but certainly not least on our home tour is my laundry room! I needed storage and wanted it to look pretty. It was a fun weekend project. There may have been some bribery to get Matt to go along with this one. But in the end I know he loves the way it turned out. He even hung another section of my grandfathers ladder in the laundry room to serve as a drying rack to hang clothes! There is even a little spot in the Laundry room for the dogs, gotta share the love! To see more information on projects you have seen in our house tour please feel free to come over and check out our Project Gallery we would love to have you! Thank you so much for joining me on our home tour! Thank you so much for letting us snoop around your house, Jacque. You and Matt have completed some amazing projects. And I’m like you – I love the concrete-look counters in your kitchen. And congrats on your little bundle of joy! 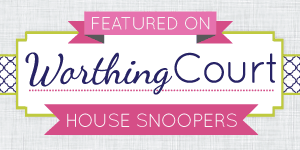 Feel free to grab the House Snoopers Featured button for your blog. Pssst! There’s loads more where this came from! Check out more House Snoopers HERE. What a lovely home! Thank you for the tour. This is a lovely home with so much charm and some history of baseball. Love the name of the dog. That treatment to that orange wall is fantastic. Good luck and health to your new addition come December!! Jacque and Matt’s home is fabulous. Every little detail and decor choice is fantastic!